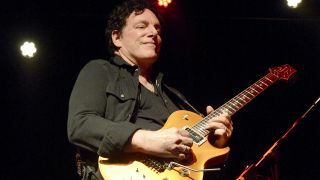 Journey’s Neal Schon had to have emergency surgery to remove his gallbladder over the weekend. The guitarist broke the news on Twitter saying he’s recovering well and thanked fans for their messages of support. He then tweeted: “Want to thank you all for your very kind wishes. This means everything to me – your friendship is what motivates me to continue to create for you all. Schon’s run of four live dates will get under way in Jackson, California, on February 22. Find a list of dates below. Schon will be joined onstage by Gregg Rolie, Deen Castronovo, Marti Frederiksen, Marco Mendoza and Chris Collins.